Keypad codes are used to arm or disarm the system. Multiple keypad codes can be assigned to track who enters and leaves the premises. 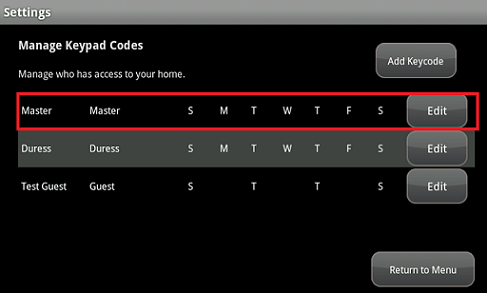 Cox Homelife subscribers can add, delete, and edit keypad codes from the Cox Homelife touchscreen. Follow the steps below to manage keypad access codes on your touchscreen. From the touchscreen Settings menu, tap Security> Manage Keypad Codes. From the Manage Keypad Codes screen, tap Edit on the Master row. From the Keypad Code screen, enter the current master keypad code in the field provided. Tap OK. Enter the new master keypad code. Tap SAVE.